Happy Bloggers Challenge Friday! This week I gave the Bloggers Challenge Players a sketch for inspiration. My Third Times a Charm doesn't refer to the sketch (although I did take creative liberties), but rather to the technique I was trying to incorporate. Since I have Compendium of Curiosities Book by Tim Holtz, I thought I'd join in some challenges using the techniques in the book. The first Challenge is Water Stamping, I tried a few different stamps/paper to get this technique to work. I found the bolder the image the better the "water stamping" looked. Water Stamping is like stamping with Bleach but without the bleach/mess and fumes! 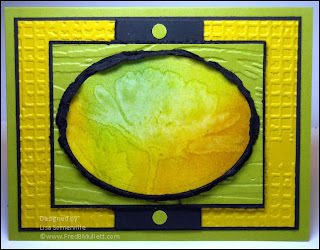 After my Manilla Tag was covered with Distress Inks, I continued onto the Water Stamping Technique using the beautiful Daisy (Code:FBM_367) from Fred B. Mullett. 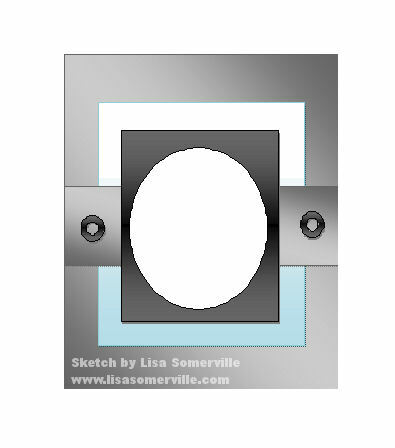 My image is cut with a Spellbinders Oval Die, layered on a Black Panel, then added the Torn Frames Technique. The Kiwi and Curry panels are embossed with Texture Fades Folders. Here's the sketch I gave the team to work with. Looking for more inspiration, click on the Bloggers Challenge Logo on my sidebar to see what the other players created this week. If you'd like to play along, just leave a direct link to your creation in the comments section. Ahhhhhh, I luv it, I imagine it's beautiful irl,luv the colors you choose and the dbl fades! Love it Lisa and it came out fantastic! It took me six attempts, so I am relieved to know that some of the "greats" had redos!!! Only 3 times? I'm envious! It took me about 15 to get one I liked! Very pretty! Your sketch is great, too, and-- as always!-- your card is gorgeous. Thank you so much for joining the Compendium of Curiosities Challenge at Studio L3!!! Great technique- love the great image- sounds like a fun technique to try. Great Layout challenge! Very beautiful. Those colors rock. The waterstamping turned out fantastic. This is gorgeous!!! Your efforst were well worth it! The thumbnail is beautiful.....again, I can't see any images on your post! I am so frustrated.....Blogger Help is no help at all. It doesn't happen with all blogs, but just random ones and random posts. Wow you always come up with some wonderful and unique techniques for your card. This water stamping is beautiful. 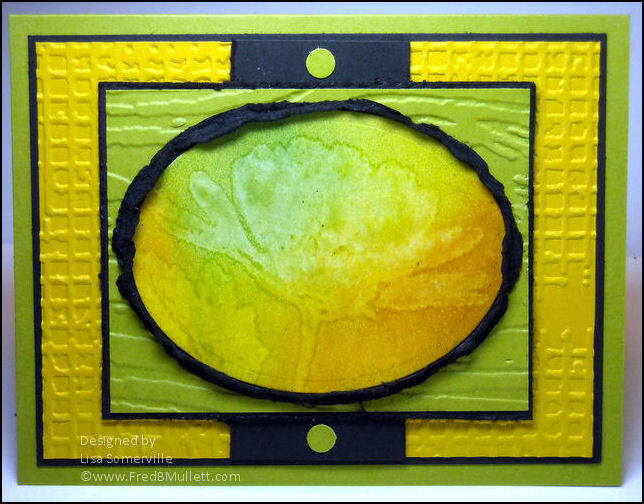 Love the colors you used and all the great texture your card has. ooohhhhh what an awesome card! love that technique - will have to try it out. i still have not gone through my book...EEK! I love the Kiwi and Curry...combo..your card just glows off of my screen...have to check out the techie...thanks for the challenge Lisa. oh Lisa - this is beautiful - a gem not a charm! Love your choice of colors!! Great texture and it turned out wonderfully! Beautiful....love all the texture and the colors you used together! AND I'm so happy to know that I'm not alone....that even those that make it look easy have a bit of trouble sometimes! Yours turned out beautiful! Love the colors on the background and the beautiful images. Wonderful card!! Love the technique....I think I may have to check out that book!! Love all the textures you added!! Awesome job! Beautiful card, love the watered image, it's gorgeous.